Other person: I sure do love this spring weather. Me: I just hope we don’t get a late frost again this year. My organic heirloom radishes have already begin to sprout on my rooftop garden. Other person: Oh that’s cool! Rooftop gardens are really popular now. Me: Well, I had a rooftop garden before it was mainstream. You’re just jumping on the bandwagon. Other person: I’m thinking of getting a burger, what are you doing for lunch? Me: I packed a salad with organically grown lettuce, tomatoes, radishes, and cucumbers. I grow my own salads at home in my roof garden since the produce they sell at the farmers’ market is never fresh enough for my refined vegetarian palate. Meat is murder, murderer. These are extreme examples, surely. Especially considering that I don’t think I have ever turned down an offer to grab a well-made burger, and I am rarely that obviously vindictive about other people’s life choices. The point remains the same: I have a roof garden. The truth is that everyone can grow stuff. As a matter of fact, stuff has been growing all by itself for a long time. Roof gardening only has a few adjustments to compensate for the fact that you’re on a roof instead of on the ground. The biggest adjustment I had to make is moisture control. Our garden is on a black rubber roof, and I have had to employ various strategies in order to keep my vegetables well-watered. I had read about self-watering containers in The Urban Homestead a while back, and tried them out for the first time last year. 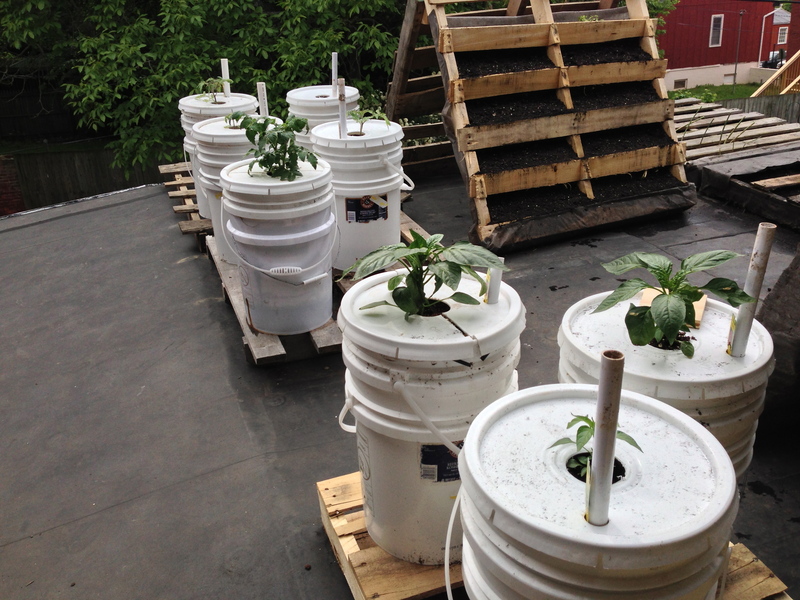 This year we went into high production and tripled the amount of self-watering containers we use. 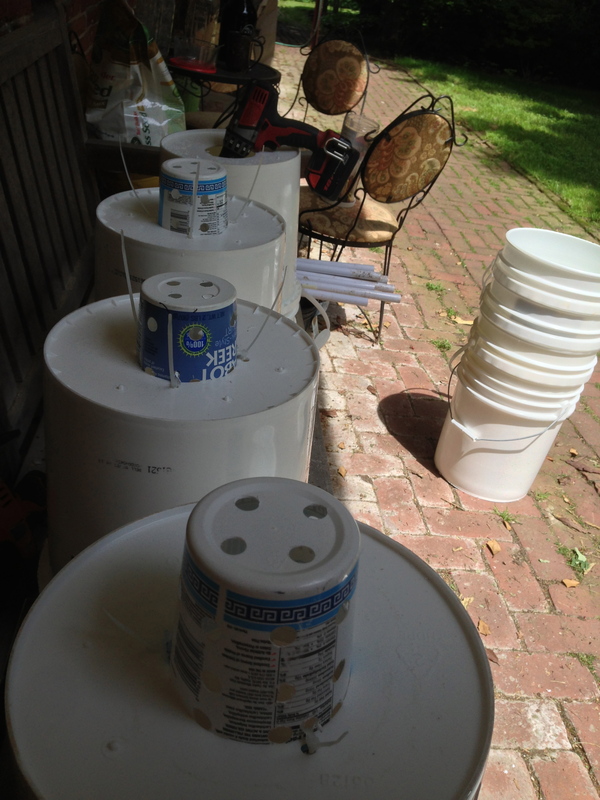 Building a SWC is a fairly simple process, and consists of two nesting 5-gallon buckets, a wicking chamber, and a piece of PVC. I only caution you to make sure that you use food-grade plastics so as not to leach any harmful chemicals into the vegetables you are growing. I found old pickle or sauerkraut buckets from a local restaurant that didn’t charge me to take them off their hands. The smaller wicking chamber we made out of 32 oz yogurt and sour cream containers. The way they work is really ingenious, and unfortunately I can’t even take credit. Between the two nesting buckets there forms an open reservoir. The smaller container, drilled with many holes, goes into that reservoir. 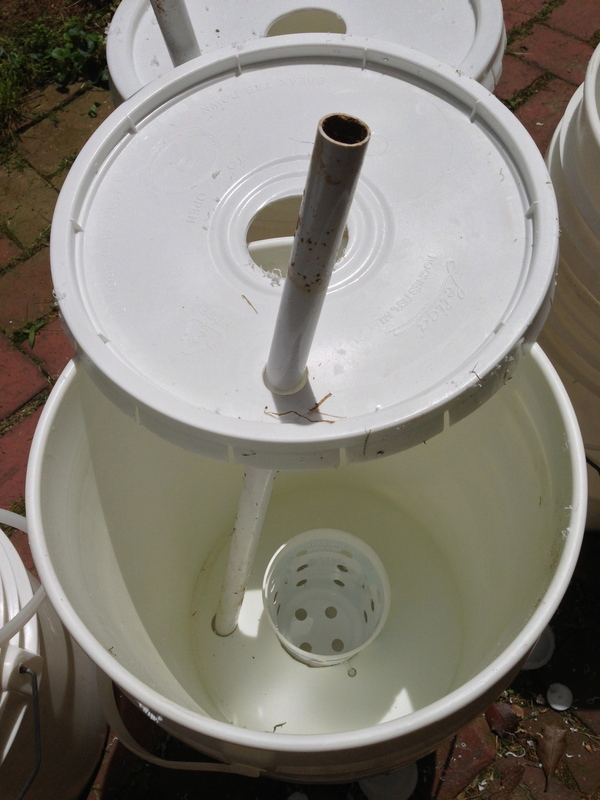 When everything is put together, a PVC pipe goes from the top of the bucket lid down into the reservoir, allowing you to easily fill the reservoir with water. After filling the inner bucket with dirt, the smaller container acts as a wicking chamber, drawing the moisture up from the reservoir and delivering it to the growing vegetables. This closed system keeps evaporation to a minimum and an even moisture level in the soil throughout the hottest days of summer. This year we have six tomato plants, four pepper plants, and an eggplant all growing from SWCs. Since our roof gets so hot, we also put them on top of pallets to avoid heating the water unnecessarily. The best part about it all is that I didn’t spend a dime to build them!